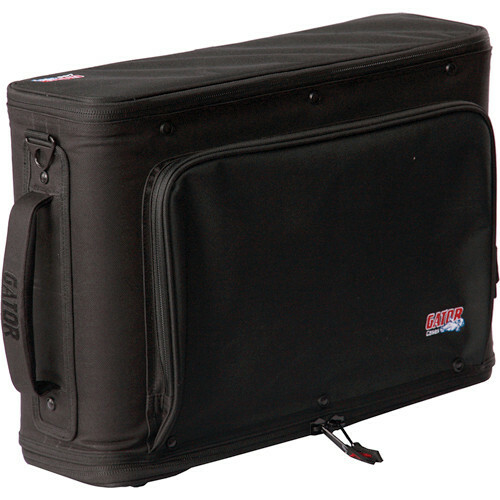 The 3U Lightweight Rack Bag (Black) from Gator Cases provides an ideal way to carry and protect effects processors, recording equipment, and sound modules. It features sturdy construction -- the exterior is made from 600 denier nylon with an aluminum internal frame that is reinforced with polyethylene. A rear flap allows easy access to the entire panel of equipment, while an exterior pocket provides storage space for any accessories you may need. Both the main compartment and pocket have secure, zippered closures. The bag can be carried using the ergonomic, soft-grip handle. Box Dimensions (LxWxH) 23.0 x 17.0 x 12.0"
3U Lightweight Rack Bag (Black) is rated 5.0 out of 5 by 1. Rated 5 out of 5 by Edward from Strong, Portable and Lightweight I bought the 3-space Gator Rack Bag to carry audio/computer interface gear for mobile recording situations. This consists of a computer interface, 8-mic preamp and a Furman Power Conditioner. A regular molded case offers better protection but the rack bag concept is lighter and easier to carry. It is worth the extra money to get his model, which has an aluminum frame and plastic panels under the nylon. The large, zippered pocket is handy for holding cables and communication adapters. It has one handle on the short side, and a shoulder strap. It would be a nice addition to have handles on two or three sides rather than one. It is a little short for full-depth rack gear, but everything fits if you remove power and audio cables. In the field, it fits on a small table with the laptop on top. 3U is large enough for most jobs, and has enough room to reach inside. If I need more channels or a UPS, I put them in separate cases. 30 pounds each is a lot easier to carry than 45 (or more).